← Spiritual Milk? Do you get enough? Has it changed? 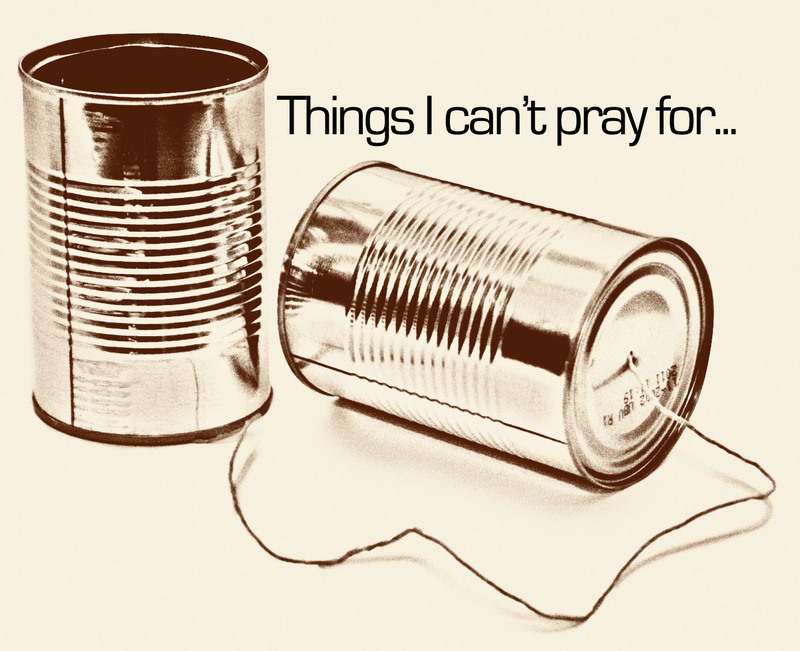 I’ve come to a place where there are certain things I just can’t pray for. Maybe it’s just a lack of faith on my part. Or maybe it’s that I’m no longer naïve to the nature of God or His will. I write today because there are times when I find it so difficult to pray. Sometimes I feel in my personal life and as I observe in others prayer is nothing more than some superstitious recited cantation. Far be it from me to be the judge of anyone’s heart or intentions, but by the things we pray for sometimes it’s hard not to draw conclusions. I think my own difficultly in prayer has risen out of some very common questions. So maybe I’m just lack faith, but there are things that I can’t pray for anymore. I can’t pray for finical gain above what my family needs to survive. I understand living in America already places in me top percentages of the world’s rich. Instead I find myself praying for faithfulness and wisdom for the things that God has given me. I can’t pray for parking spots when owning a car means I’m living in a reality that 90% of others in this world are not. That’s like saying God indoor-pluming is not good enough, I want my toilet to be gold plated. Hmm I’d have to say I agree! Great post! So Jon… Reading this actually makes me think about if praying for yourself at all is right. If the Holy Spirit intercedes and God knows your needs, why do you need to pray for yourself? Should our pray life only be filled with prays for others, or at least mostly of others??? I think to answer your question I would have to refer back to scripture. What is the biblical precedent on prayer? Of all the recorded prayers what are they for? What was their purpose? I think its OK to pray and ask for personal needs. Jesus told us to. Remember…ask,seek, knock. However, James does remind us to pray with right motives and intentions. To me this all relates to what I feel the best definition of sin is, and that is selfishness. We must ask ourselves why am I praying for a parking spot???? Who has to gain from our prayers? Will God receive the glory or will we? Will this bless others or only me? And that’s not to say we are to be masochistic, but we are called to be sacrificial.